Enteroferm Gel stabilises the intestinal flora and physiological digestion, in case of diarrhoea caused by feed intolerance, a disturbed intestinal flora after antibiotic treatment, after deworming, stressful conditions, change of feed or rearing. A viable bacterial strain of Enterococcus faecium DSM 10663 NCIMB 10415 (Oralin®) which survives passage through the stomach and multiplies in the small intestine. High levels of the vitamins A and E, and selenium, which help to improve natural resistance and encourage an early development of the immune system. 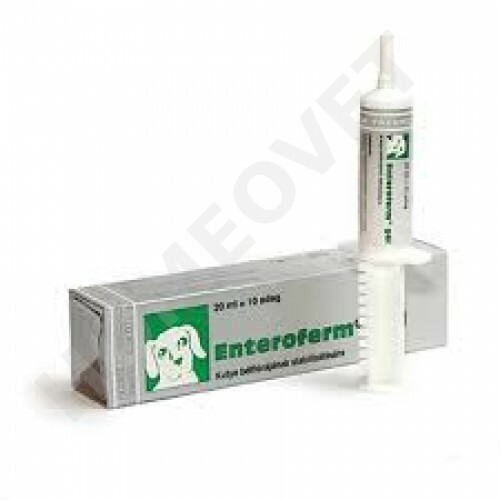 Enteroferm Gel is tasty for dogs and tends to stick to the palate, so that dogs cannot spit it out. The Enteroferm Gel syringe contains ten doses and allows exact and easy dosing. 2 ml per day administered orally for 10 days.